True to its commitment to providing state-of-the-art cosmetic treatments, Shu Cosmetic Surgery Institute is the first cosmetic clinic in Minnesota to offer skin complexion analysis with the newest (6th) generation VISIA, a method of facial rejuvenation planning tailored to a patient’s complexion proﬁle. Patients will receive an initial VISIA analysis report as their baseline and additional complimentary reports throughout their treatment programs. VISIA imaging and analysis provides you and your skin care professional with the comprehensive data needed for a solid rejuvenation plan to tackle your complexion requirements or problems. An invaluable aid in monitoring your complexion’s vitality, VISIA checks the overall eﬀectiveness of your skin care regimen over time and helps create and execute goals for your skin. This analysis should be the first step in achieving optimal skin renewal and is truly the individualized care needed to maintain your complexion’s most radiant health. 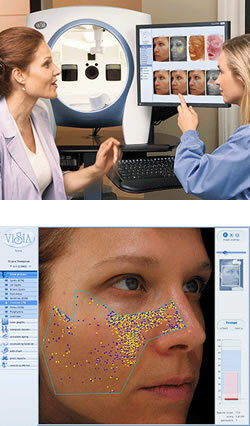 VISIA analysis works by using a multi-spectral imaging and analysis to capture key visual information on eight areas aﬀecting complexion health and appearance: spots, wrinkles, color variation in the skin tone, pores, sun damage, subsurface pigmentation, vascular conditions, and porphyrins (evidence of bacteria in pores). Your characteristics are then compared to others of your same age and skin type. Your skincare professional will then use this comprehensive information to plan the most optimal treatments and regimens for you with a summary report providing a clear overview of your facial skin condition.